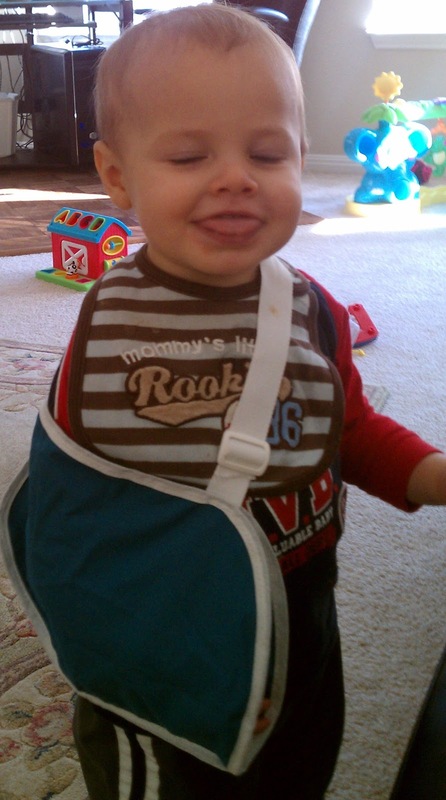 His Building Blocks: Old cast is off--but this, unfortunately, is not over. Old cast is off--but this, unfortunately, is not over. Yesterday was a very traumatic afternoon for us. We were all very excited to finally get Luke's cast off. We were thinking of all of the things we would be able to do once it was removed. When we got back to the exam room, the medical assistant brought back this very scary looking cast cutting machine. Luke had to wear ear protection because the machine made such loud noises. It had a rotating blade on the end of what looked like a vacuum hose that the assistant use to slice the cast open. Luke was so scared. 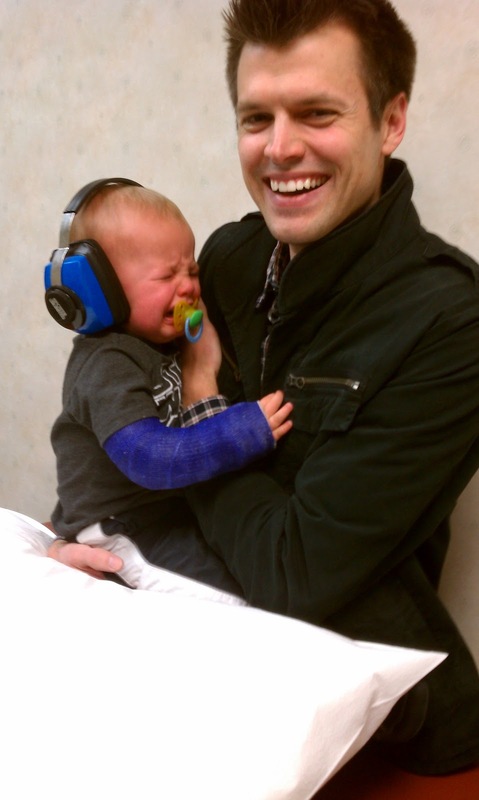 Then, once the cast was removed, mommy and daddy were scared. His arm was bent. They took X-rays, which showed the arm was healing bent. Because of the angle this picture was taken, it is really hard to tell from this picture just how bent his radius is. (The radius is the forearm bone that is farthest away from you when you have your arms by your side) So, now we are going to have to take him to the surgery center at 6am tomorrow morning to have a procedure at 7am. The procedure will involve the doctor "unbending" the arm while Luke is under anesthesia. Luke will then be in a splint or cast for another 3-4 weeks. Drew and I went through a process of many emotions yesterday. Emotion 1--Sadness. I was so sad for my little baby. Why does someone so young have to go through all this? Poor little guy. Emotion 2-- Anger. First, we were upset with the physician who cared for Luke. Why didn't they set it properly when putting him in the cast? I asked if they were going to take new X-rays at our first appointment there, and they said it wasn't necessary. I asked about his arm looking bent when they put him in the cast, but the doctor said it would straighten up fine. Emotion 3-- Fear. How would Luke do under anesthesia? 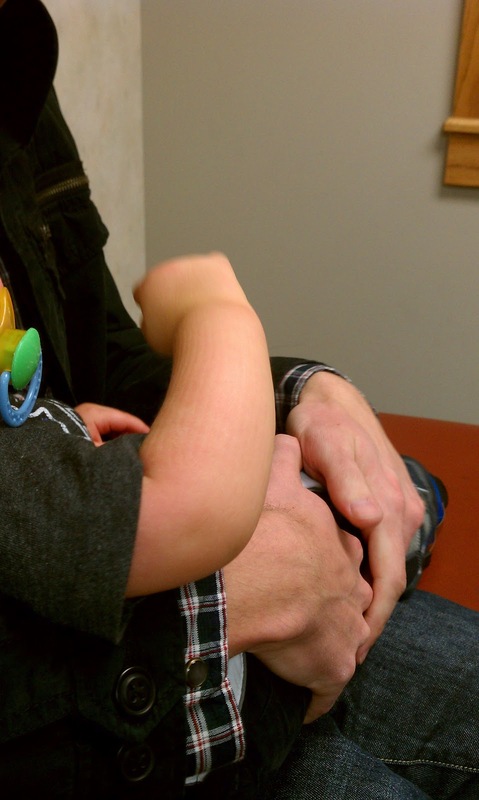 What is the doctor is unable to bend the arm back into place--will he then need a full surgery? Emotion 4--Guilt. Once we got back home, I began re-hashing all of the events of the day the accident happened. What if I carried Luke with me into the kitchen when I was putting his sippy cup together? Then he wouldn't have climbed on that chair and fallen. Finally, after a lot of prayer (in fact so much that I only slept a few hours), I again succumbed to the fact that none of this matters any longer, because what has happened has happened and God is in control. Here is an encouraging song by Stephen Curtis Chapman that really says it all. So, today Luke is his normal rambunctious self, and I am busy chasing after him. He is only in a splint, so he has to be very careful. I just put him down for an early morning nap and I am already exhausted! Please pray for our little guy. Wow, I missed a couple days of not checking your blog and you have added so much! We have been praying for Luke and I'm glad to hear that he is doing o.k. Hopefully in a few weeks he will be playing with his outdoor toys with both arms! We will continue to pray for a successful recovery!